All employees look forward to taking a vacation once in a while, especially when they have accrued paid time off to use. 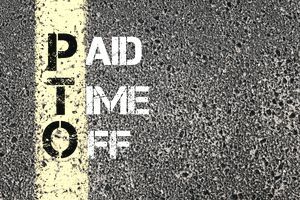 Paid time off, or PTO, is also a major factor for employees accepting job offers from companies. The more generous the PTO, the more attractive a company can look to candidates who value work-life balance. Even though paid time off is currently not mandatory for employers to offer to their workers, most understand the importance of time off for a healthier and happier workforce. New employment law in California is shaking things up in terms of how employers can offer paid time off, and it could force employees to take time off even if they want to save PTO up. The Healthy Workplace, Healthy Families Act is a new paid leave law in the state of California that all employers must follow. The new law requires that all employers with at least one employee permit their employees to accrue sick leave at a defined rate of one hour per every 30 hours worked. Because of this new law, part-time and temporary workers are now covered. The state’s law took effect on January 1, 2015, but employees were not able to begin accruing sick time until July 1, 2015. The new law allows companies to cap accrual of sick leave at six days but does not require them to do so. The law also allows employees the chance to cap their use of sick days at three per year of employment but does not require it. Per the new law, employees can use sick time for the care, treatment, preventative care or diagnosis of a health condition for themselves or a family member. Family member is defined in the law as a parent, in-law, child, spouse, sibling, grandchild, grandparent, or registered domestic partner. Due to the new law, it is quite possible that many companies will need to rewrite their policies regarding sick leave and paid time off. Most companies only offer paid sick leave to full-time employees or ones who work a set number of hours per week. The new law requires companies to provide sick leave to employees who work 30 days or more in a year. This means that full-time, part-time, temporary, contract, seasonal and per-diem employees would be covered by the sick leave law if they meet the hourly requirements. Plenty of companies discipline their employees for excessive absenteeism. Others require employees to find replacements if they wish to use their sick time. This requirement will no longer be permitted under the new law. The law also makes it illegal for companies to suspend, discharge, or demote any employee for using their accrued sick leave. Since the new law will undoubtedly cause companies to change their policies for sick leave and paid time off, employees will need to be notified of any changes within seven days. The notice must be in writing. If a company’s current policies mirror the requirements of the new law and nothing needs to be changed, written notice must still be sent to employees regarding the requirements of the new law in California. Issues are going to arise when it comes to the new law and seasonal employees. The new law states that if an employee leaves a company for any reason, and returns to work there within a year, all of their previously accrued sick time must be given back to them. The requirement becomes null and void if the employer allows the employee to cash out their accrued sick time at the end of their seasonal employment. If the employee only works 60 days, leaves and is rehired within one year, he or she will not begin accruing sick time until having worked another 30 days to meet the 90-day probationary period requirement. The bottom line here is that employers operating in the state of California now have to offer sick leave to all employees who work at least 30 days in a year. Employees must use this paid time off throughout the year to ensure they don't miss out.